This week’s cake for the heavenly cake bakers was the Holiday Pinecone Cake. I decided early on that I was going to make a holiday log, rather than a pine cone, because I wanted to make meringue mushrooms to go with it. This post is late, and rushed, because I’m at my parents’ for the holidays. Between computer problems yesterday and running around helping Mom out with various things today, I haven’t had time to write this up. Sorry for the lack of details or clever commentary (not that you normally find clever commentary here, anyway)! I first started by making the fondant for covering the cake about a week ago. On the actual day of baking, I started by making the ganache, since it has to rest for a couple of hours before using. Process the chocolate until finely chopped. Scald the cream, and add it to the chocolate with the processor running. The result is a perfectly smooth creamy ganache. Next step was making the biscuit roulade. While the oven was preheating, I toasted my almonds for the ganache. The biscuit starts by beating together egg yolks (and a couple of whole eggs) with sugar until they’re thick and light in colour. Then you add the cocoa that has steeped in hot water, then add the flour in a couple of additions. 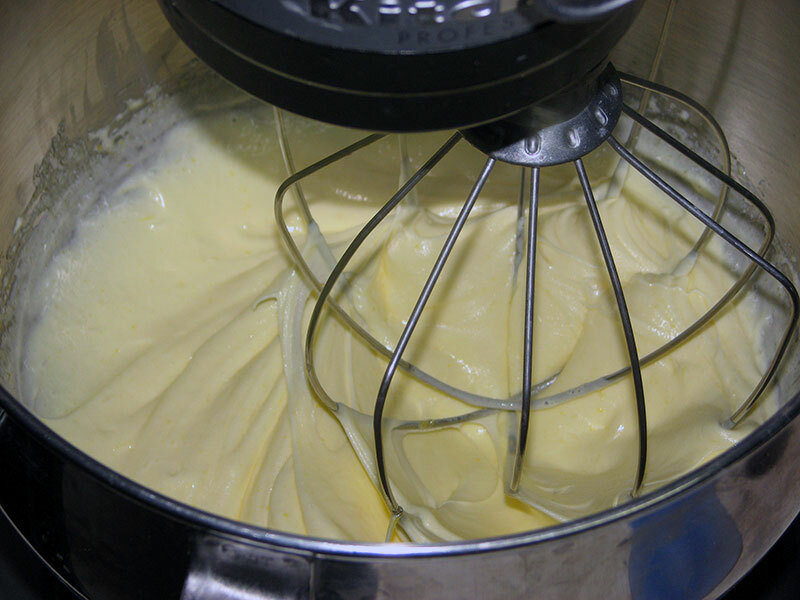 Set the above mixture aside, and make the meringue (after you’ve cleaned your bowl & whisk attachment). I think I may have overbeat my whites, but that didn’t seem to bother anything. After carefully folding the whites into the egg mixture, spread the batter in your prepared pan. I took a bunch of pictures of the cake when it came out of the oven, because I wasn’t convinced it would ever look this pretty once I took it out of the pan. It came out perfectly! And I successfully rolled it up to cool! Ok, so now I’ve got everything ready. Cooled biscuit, half the ganache with almonds in it, half without, meringue mushrooms, and chocolate fondant. The division of the ganache was an idea Hanaa had suggested in a comment on Marie’s blog. Leave some of the ganache without nuts, to keep them from poking through the fondant. First, spread the almond ganache on the unrolled biscuit. Next, roll it up. I think maybe I should have chilled it a few minutes here to keep it from running out. Cover the roll with a thin layer of ganache, to give the fondant something to adhere to. Roll out the fondant. I use a Wilton mat that I got for one of the Wilton decorating courses I took. 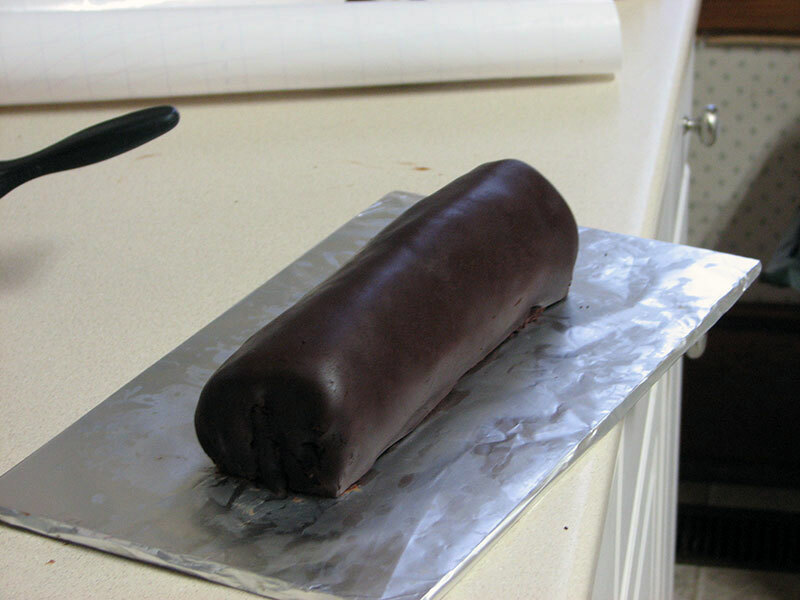 Cover the log with fondant. I had a few wrinkles, but I wasn’t too worried about it, because I was planning another thin layer of Ganache. Posted on December 29, 2009 by KristinaPosted in BakingTagged Baking, chocolate, heavenly cakes. Kristina, beautiful! Looks like the one in Rose’s Cake Bible. 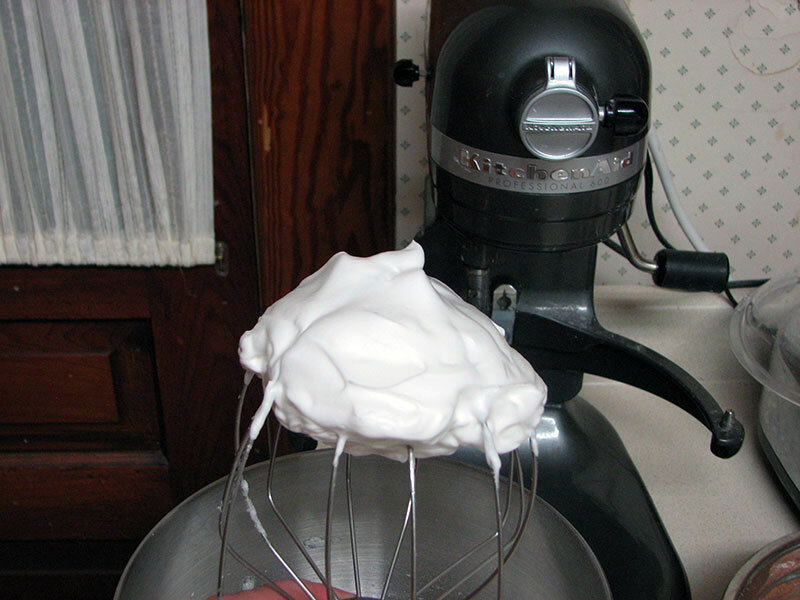 I’ve always wanted to make meringue mushroom. Was it hard to do? Jenn, the mushrooms are really easy to do. I’ll post the instructions after I get home frommy parents’ place in New Brunswick. It’s been a hectic week! Looks fantastic. A great idea to make a log instead of the pinecone! And I second Jenn on your mushrooms being beautiful. Great job, and glad that you found the time to post. Your Aunt would have been so impressed with that as her Xmas present. This is a super clever idea! 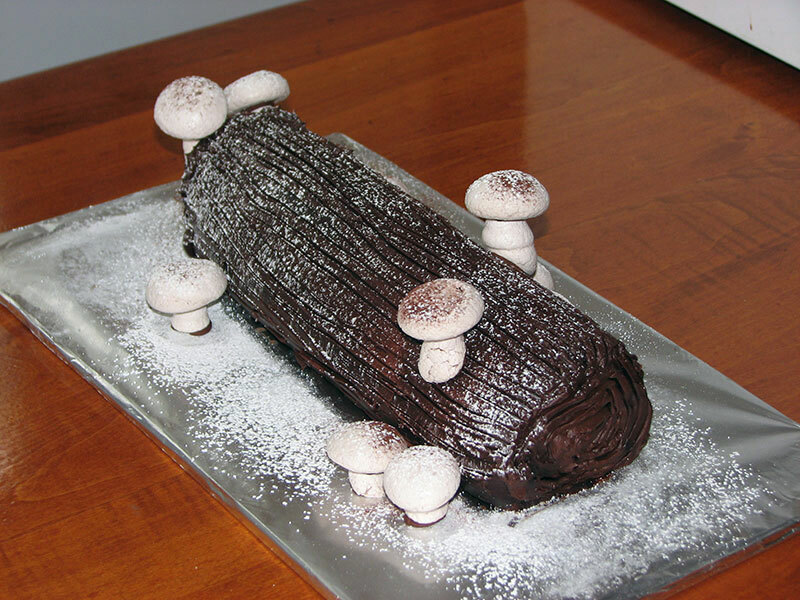 I have long admired Yule log cakes with meringue mushrooms. Your aunt must have been delighted. Well done! Quite frankly, I like the look of your traditional yule log much better than the weird pinecone shape. A job very well done!